Why our thoughts are so important? And why in my previous post “How to start a day in a good and happy way” I wrote: You should decide your first thought? First of all, as I mentioned before, thoughts create our moods and our emotions. So, if we think of something nice we will feel good, but if we think something bad of course we can not expect to feel good, in fact, it is just the opposite. I guess it all went bad and we did not see at the time that one bad day was over, right? But if we go back in time at the beginning of the day we will realize that everything started with one negative thought. The cause of a bad day has been simply generated by a small episode, maybe even insignificant, such as hurting our knee against a chair when we just woke up and we were leaving the room. The thought associated with this small episode however, has sparked a series of other events dictated and created by our thoughts. Let me explain it better: hurting our knee, obviously created some pain and by the association of pain, such as that in the afternoon we had a dentist appointment and so on, we created a negative feeling with the result that in our head we had already classified the day that has just started as a bad day and so it just just got worse. A thought attracts another thought, it is like a chain, a bit like the domino effect continues. A positive thought attracts a positive thought, and a negative thought attracts a negative thought, whether we like it or we do not like it, we believe or do not believe it, that is how it works. It’s up to us to behave accordingly, decide whether we want to believe and accept it and knowing how to use this knowledge to our advantage, to live a happy life that we want. This is why our thoughts are influential and consequently it is very important that in the morning when we wake up we decide our first thoughts to decide the mood with which we want to live the day. Of course, throughout the course of our day, we may have unpleasant situations, events, etc. that we think we have not created. Is it ever happened to you? What happened is obviously different from person to person, but the thing in common is that this particular event has changed our mood, the day, and so on. There are many events that happen to us during our lives, so strong and traumatic that when compared to a fight in the ring, definitely we would go to the mat. Unfortunately we can not do anything to prevent these events. But we can learn how to react in certain situations and ride the wave so that the wave does not throw us under water. It is hard to stay positive at times and is perfectly normal that happens, the important thing is do not dwell too long on a negative state but we should quickly return to a positive frequency. How can we do that? 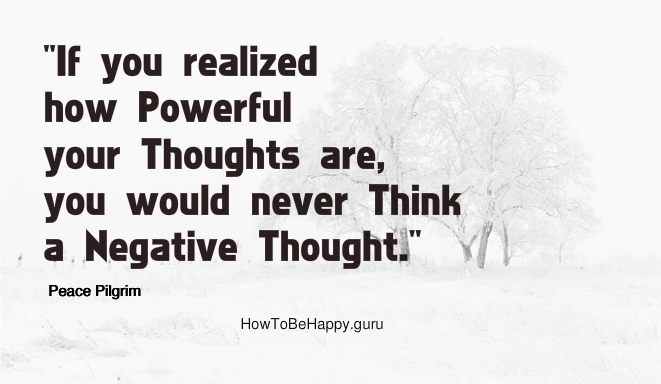 We need to replace our negative thoughts with positive thoughts. We also need to change our attitudes through life, happiness is an attitude of mind. The longer we stay in a negative state, the more likely it will become a habit, a bad habit but we want to create instead a positive and good habit, in fact Positive thinking can help to create our happiness. Although our thoughts are extremely important, we must keep in mind, however, that thinking too much is bad. Sometimes we think so much that it seems to have turned on a CD in our minds that continues to play without interruption. In the case of a CD player, there is the button to stop it but not in the case of our mind. Obviously, we do not have a button as this would make it very easy to control. But how can we create this button? It is very simple, learning to live in the present. The important thing is, keep in your mind all the time, to stay positive and make a habit of it.